Welcome to the June newsletter from CigElectric! Thank you to all our new and returning customers for the month of May. As Summer is still yet to show we thought a little of our own sunshine was in order. A discount on variable voltage batteries and kits and a continued discount on our 30ml bottles! Of course as always a round up of all the other e-cig news from May. 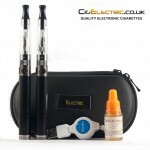 Why not upgrade you kit or treat a friend with a variable voltage start kit or battery. For the month of June we are offering 15% off all variable voltage starter kits and batteries, simply use coupon code: “VV15off” at checkout to receive your discount. We would like to offer all existing customers a 10% discount on all 30ml e-liquids for this month. Simply use coupon code “CE1030” on the checkout page to redeem the discount. Following on from the most popular box mod of all time, the MVP 2.0, the new MVP 3.0 version goes even further pushing the performance and design to a whole new level. With increased power output this box mod provides enough power for any atomizer, from simple clearomizers to advanced atomizers. It’s increased battery size means you will never be without power providing around 38 hours of vape time. The MVP 3 can also recharge your other devices via USB so it is handy to have around for its own power supply. A fully redesigned case, upgraded high quality OLED screen and a wide range of features, this is the box mod to have. Thank you for shopping with CigElectric, we appreciate every customer and order. If you have any suggestions or comments we would love to hear them! Get in touch here.